Florida Real Estate: Jupiter Farms Gem on the Market! Jupiter Farms Gem on the Market! 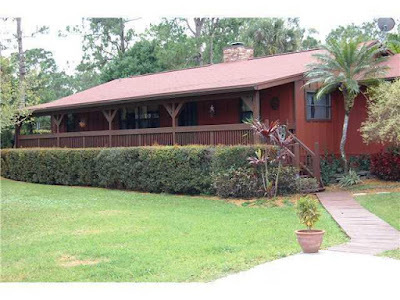 This perfect country charmer is located in the enviable Jupiter Farms, which provides a rare sense of privacy. Enter this four bedroom, three full bathroom stunner featuring two master bedrooms! This home boasts a fifty foot covered front porch into a large living room with a cozy brick fireplace. The updated kitchen has granite counters and handcrafted wood cabinetry. The master bedroom and bathroom addition has an over sized walk in closet. The bathroom has an extra large shower and Jacuzzi tub. The newer roof, air conditioner and water heater have been recently replaced. The house is stem wall constructed with foam insulation. Beautiful lushly mature landscaped one and a quarter acres is totally fenced for extra privacy. The exterior siding is in excellent shape and recently painted. The beautiful private pool area with a hot tub is perfect to relax and host outdoor gatherings. Several outbuildings including shed, two stall barns, a chicken coop, a scenic pond with a dock. The two car garage is partially converted to a 19 X 14 game room that is not included in living square footage.The sellers will convert back at buyers request. Ballen Isles Estate Just Listed!